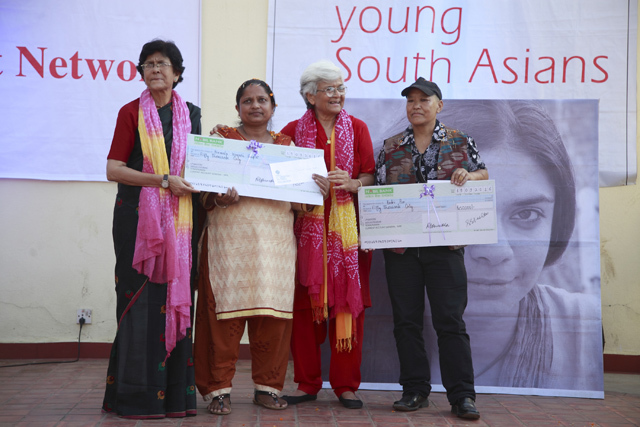 Women’s right activist Abha Bhaiya and Kamla Bhasin hand over the Sangatee Grant Award to Nirmala Kumari Gupta and Badri Pun on Monday. Leading feminist Kamla Bhasin launched the South Asian edition of the One Billion Rising (OBR) 2017, a global campaign against violence against women and girls, in an event in Kathmandu on Monday. Since 2013, people in more than 200 countries have come together every year on 14 February to call for justice and equality for women through dance, music and other creative actions. This year OBR calls for solidarity against the exploitation of women. Judge Sapana Pradhan Malla and Convention on the Elimination of all Forms of Discrimination Against Women (CEDAW) member Bandana Rana were also felicitated during the South Asian celebration event. Likewise, the first recipients of the Sangatee Grant Awards initiated by Nepali feminists and Civil Society Organisations to recognise organisations and individuals working in the field of women and minority issues were also announced during the event. Women Forum for Women, an organisation advocating for rights of women working in informal and entertainment sectors, LGBT rights activist Badri Pun and Dalit rights activist Nirmala Kumari Gupta received the award. This year’s Meeto Memorial Award for Young South Asian were awarded to Jayanthi Kuru-Utumpala, the first person from Sri Lanka to climb Mount Everest and Wasfia Nazreen, the only Bangladeshi to have climbed the seven highest peaks in each continent.